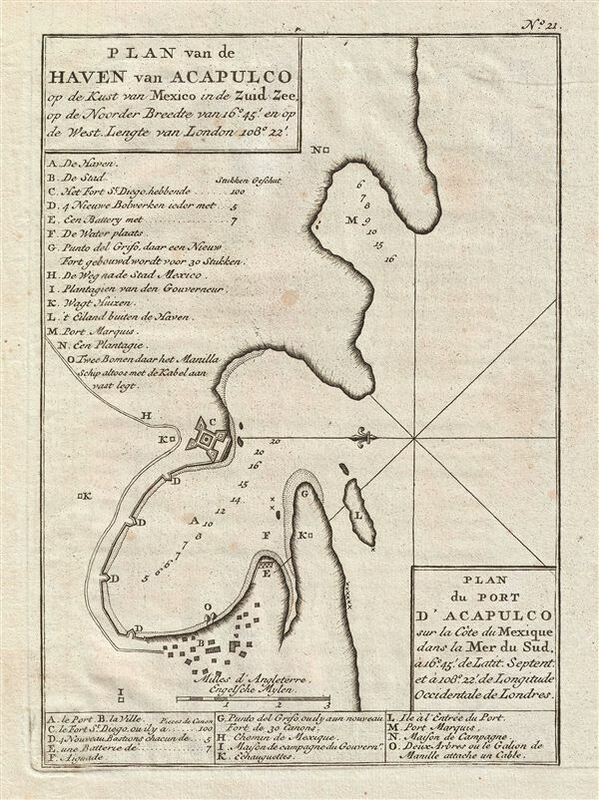 Plan du Port d'Acapulco sur la Cote du Mexique dans la Mer du Sud. An uncommon 1751 map of Acapulco, Chile, by the British Admiral George Anson. Oriented to the east, the map details Acapulco Bay and its fortified port. In the 18th century Acapulco was the strategically important starting point for all Spanish trade across the Pacific. Until Anson's capture of the Neustra Señora de Covadonga, the Spanish dominated Acapulco-Manila route was the only viable link between the New World and the rich markets of Asia. Anson captured the Spanish treasure galleon not far from Acapulco as it began its trans-oceanic voyage. The event marked the decline of Spanish hegemony in the Pacific and the rise of the Great Britain as a regional power. In preparation for his historic attack on the much larger and better armed Neustra Señora, Anson fully reconnoitered the Acapulco starting point. This map was issued for the 1751 Dutch edition of Voyage Round the World. Though issued later than the english and French editions, the Dutch edition is highly desirable for its use higher quality paper and superior fully re-engraved map plates. Baron George Anson (23 April 1697 - 6 June 1762) was a British commodore and a wealthy noble. Following Anson's aristocratic upbringing on the family estate of Shugborough in Sataffordshire, he joined the British Navy. Anson went through a series of rapid promotions and, in 1737, was given command of a fleet of six ships charged with the mission of attacking Spanish possessions in South America. This mission was ill-equipped and unprepared for the trials ahead. Storms and navigational errors took a heavy toll on the expedition. By the time Anson reached the island of Juan Fernandez his fleet had been diminished to only three ships and his crew reduced to roughly 1/3 of its original strength. Nonetheless, Anson's persistence eventually led to the capture of an immensely rich price, the Spanish treasure galleon Nuestra Senora de Covadonga. The galleon, taken off of Cape Espiritu Santo in 1743 was loaded with silver bullion and, more importantly, charts and maps detailing the routes between Mexico and the Far East used by the Spanish for over 200 years. Knowledge of this route enabled the British navy to disrupt Spanish trade in the Pacific and thus weaken its stranglehold on the Americas. Upon his return to England Anson was hailed as a national hero and made immensely wealthy by his share of the Nuestra's treasure. Anson retired from the Navy for a career in politics and was a Member of Parliament from 1744 to 1747. Anson subsequently continued his naval career with distinction as an administrator, becoming First Lord of the Admiralty (1757-1762). Seven British warships have borne the name HMS Anson in his honor. Anson County, North Carolina, and Ansonborough in Charleston, South Carolina, are also named in Anson's honor. Anson, G., Atlas to Anson's Voyage Round the World, (Amsterdam: Arkstee and Merkus) Dutch Edition, 1751.